It’s been a cool, wet May. 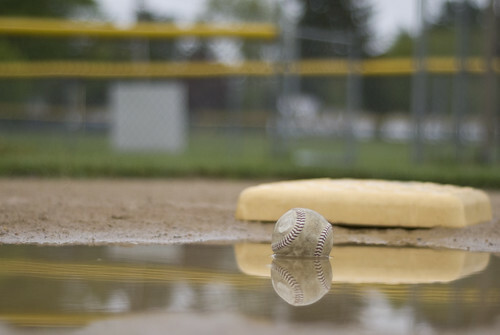 Even so, my son’s Little League team had not had a rainout yet this year. While the rain cleared up for the most part, and the other game on another field went on as scheduled, our game was postponed. The field was too wet to be playable. Sorry your son didn’t get to play but I really like this shot with the base reflection and the ball. Nicely done. Oh Great Shot PG! We had rain all last week… finally, the sun is out again. Great photo! I miss baseball. Living where I am, there aren’t many opportunities, although they do have a new T-ball league. Hoping to get my son into it once he’s old enough.